Contre Jour references Angry Birds and other popular mobile games. Contre Jour, Mokus’s recent multitouch game for iOS, offers an interesting new spin on the casual mobile game. 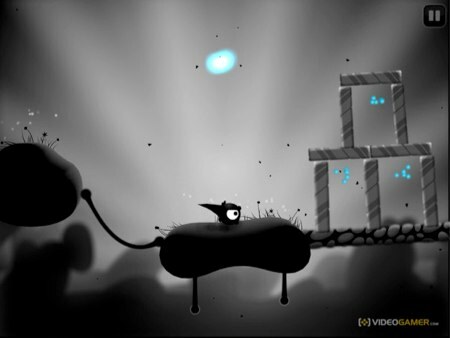 Winning Best Handheld or Mobile Game nomination at E3, Contre Jour combines gameplay elements of Angry Birds, Cut the Rope, and World of Goo with beautiful noir art design. A hauntingly beautiful soundtrack by David Ari Leon recalls Yann Tiersen’s work on Braid. In fact almost everything from this game can be traced to another game, a fact about which many app store reviewers have complained. So if Contre Jour doesn’t offer novelty, why would it garner so much acclaim? The easy answer is because it’s fun and beautiful, but the game does offer clever allusions to its predecessors, often with tongue in cheek. It wants to be compared to other mobile platformers, either for parody or to showcase the brilliant art elements of the game. What Contre Jour really offers is an exercise in tone and mood, while perhaps commenting on the state of mobile platforming games. The bittersweet soundtrack combines with dark, monochromatic levels to give the work a much more serious tone than other Chillingo titles. The opening credits reveal that our genre-appropriate cutesy circular protagonist, Petit, is a reference to Le petit prince, which also clearly inspired certain terrain textures, background art, and the world selection screen. Even the title, French for “against daylight” and a reference to the contre-jour artistic style, suggests a deeper theme than “Angry Birds” or “World of Goo.” But even with all its efforts to offer an artistic experience, Contre Jour manages not to to take itself too seriously. It’s still fun .